Michael Frew was at the heart of all Wisbech Town's best moments as they knocked Racing Club out of the FA Vase. Racing Club Warwick’s FA Vase run came to an end at the hands of their higher-level visitors on Saturday, with two second-half goals sealing their fate. The hosts, who had won four ties to reach this stage, almost took a first-minute lead when a superb cross from Luke Church was headed wide by Sean Kavanagh with the goal gaping. Kavanagh and Luke Cole were repeatedly frustrated by Wisbech’s high line but on a rare occasion they beat the offside trap, Church was just unable to latch on to Cole’s clever flick. Michael Frew struck the upright for the visitors before a brilliant slide tackle by Martin Slevin thwarted a goalbound shot from the striker. Despite having several players missing, Warwick looked the better side at the start of the second half and Church got in on the right-hand side after a Josh Cole flick-on but shot over before a Luke Cole effort was fired straight at veteran Paul Bastock in the Fenmen’s goal. Kavanagh then latched on to Jack Taylor’s long ball and outpaced the defender to get through on goal but the referee blew for a contentious foul. Just as it looked as though Racing may get on top of their visitors, a headed backpass from Martin Hutchcox was chased down by Frew who beat Tom Cross to the ball before squaring for Alex Beck to poke home. A Slevin free-kick almost drew the hosts level before Josh Blake was dismissed by the referee a mere 30 seconds after his introduction. With time running out, a Passey challenge on the outstanding Frew resulted in a penalty which Sam Murphy fired straight down the middle to make it 2-0. 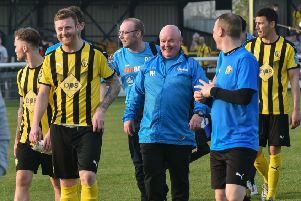 Racers had the final effort on target with Kavanagh’s shot being superbly blocked by Bastock, the Leamington-born 47-year-old drawing on all his experience to preserve his clean sheet. And while Racers boss Scott Easterlow had no argument with his side’s exit, he felt the sending off of Blake was just one of several decisions which did not go his side’s way. “Days such as these are decided on small margins and unfortunately it was they who took their chances,” said Easterlow. “I don’t like to moan about officials but I felt he totally lost control of the game. “He made two or three bad calls at vital times in the game. “He was a young ref and I think the occasion and 300 people watching and getting on his back panicked him and just made him worse.